AMA looks for gold in mining patient and physician data. 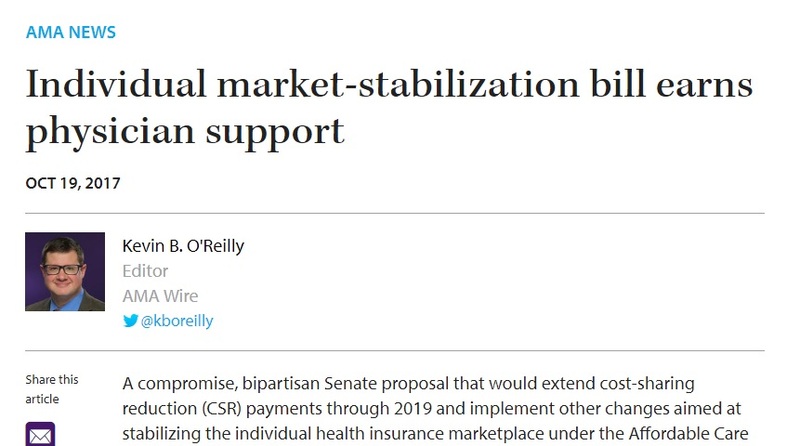 The AMA supports resuscitating the dead-end failure that is the “Affordable Care Act.” Patients have seen soaring premiums, deductibles, and medical costs, while at the same time often losing access to their doctor and other medical facilities of their choice. Physicians have suffered continued suffocation by ACA red-tape. But the AMA supports propping up this disaster of a law and throwing more good money after bad. AMA looks for gold in mining patient and physician data. Why is the AMA advocating against the best interests of doctors and patients? Follow. The. Money. The AMA has discovered it is more lucrative to sell patients and doctors out than to support their interests. Since 1983 the AMA has been making millions of dollars per year from the CPT monopoly it secured in a secret deal with the feds back in 1983. CPT has metastasized into the EHR fisaco that now plagues nearly every office and facility. Now the AMA is hoping to find another pot of gold by mining the data CPT helped to create… patient and physician medical data to be exact. How much can the AMA make of the data? Who knows, but you can read more about the new initiative here: https://healthitanalytics.com/news/ama-launches-integrated-healthcare-big-data-analytics-platform. Final MACRA rule still byzantine and unworkable, patients lose. The final MACRA rule expands exemptions, flexibility, claims ModernHealthCare.com but it is still byzantine and unworkable. Patients lose. The low-volume threshold is now < $30,000 in Part B billings OR < 100 Part B Patients.The proposed rule was < $10,000 AND < 100 Patients. The infamous table from the proposed rule showing 87% of solo docs would face a negative adjustment under MIPS has been “bleached.” The sanitized table no longer lists solo physicians separately, and claims that only 10% of practices from 1 to 9 physicians will will face negative adjustment. Click here for image combining both new table and old table. Supposedly, overall, 94.7% of eligible clinicians will get a positive or neutral adjustment with 5.3% receiving a negative adjustment. CMS will be accepting comments for 60 days, however the online comment portal is not yet open as far as we can determine. Stay tuned! “Sully”, The Government’s Flawed Algorithms and Simulations Were Wrong, What Doctors Can Learn From Pilots. As a matter of fact the only real correlation between doctors and pilots was revealed a few years ago where a former United Airlines pilot duped even the AMA on the fact that he was a cardiologist and even had to retract several papers he had written. William Hamman was a pilot for United Airlines who had started in med school years ago but never finished. After he was exposed, his pilot job at United soon disappeared. So in my opinion only, this is really the correlation between doctors and pilots I ever found (grin). I went to see the move “Sully” yesterday and that is the screaming value that I walked away with, don’t let flawed data and bad algorithms (flawed) produce inaccurate information that makes you begin to question who you are and use data to turn an individual who is hero into a zero. The NTSB with their algorithms had it all wrong. If you have read my blog for any amount of time, I preach this all the time on how folks get too wrapped up in stats and numbers and forget the “human” element and that’s what this move was all about. Sure algorithms can be good as well and its more in the fact about how we use them for knowledge, and not about scoring people into data oblivion with flawed data and assumptions from Quants and Data Scientists who “think” they have the ultimate answers, especially in the area of predictive analytics. Due to a lot of the over hype of the power of algorithms and how they are marketed, we have a real problem today in the fact that people can’t seem to tell the difference anymore on what’s a “real world” value and what’s a “virtual world” value. I wrote about that initially in 2013 and it seems to be getting worse all the time, and so far I have not read any news stories of folks looking for Pokemon on a commercial airliner yet, but I have this feeling that the “dupes” who confuse both values will show up there soon as they have appeared everywhere else such as hospitals and police departments (grin). If you follow me on Twitter at all, I have a special name for this scenario, “The Dupes of Hazard Society”. In the course of my life I have happened to run across and meet a couple other pilots who were in these types of life and death situations and there’s not a lot of time and in both of those instances, it too was the human element that saved the day, just like Sully did. As a matter of fact, there is an airmanship award given every year by the Fraternal Order of Daedalians for the act of heroism by a commercial airline pilot. After seeing the movie and how the NTSB was stuck on their algorithms to turn the tide into discounting Sully, I feel he was left out of the award given in 2009. You can read about the award here and see how no award was given in 2009. Here’s a clip from the page that tells what the award is. There are a number of awards and it’s mostly for the military but this is one award given to commercial airline crews. If you look and see, in 2009, there’s no award for Sully on the Hudson river. In 1998 you can see the award for Bruce Harris from Delta, who also “sucked in birds” and was able to save the day and all the passengers. Back on course, I couldn’t help but notice how the movie created a “personal struggle” with Sully in the fact that after a while, you do have a tendency to doubt yourself and we all do it, so there’s nothing new about that, but when you have forces such at the NTSB pushing the envelope with flawed data and simulations, anyone would start to wonder if there was anything that could have been done differently. The item they forgot which was brought out in the movie is the fact that this as a life or death panic situation and the flipping algorithms after the fact to try to show that the judgement on the part of Sully was purely wrong. Sure continue the investigation to get to the truth, but to try and take away the heroism shown with this type of decision that had to be made with very little notice and the lives of 155 passengers, was obscene. It’s like being in the “panic room” with a lot of company, the passengers. Perceptions are a big part of our world and I liked the fact that the movie did address what I call Perception-Deception with the NTSB and their attitudes with their simulation algorithms. I see this all the time where the Dupes of Hazard will fight with some math formulas and algorithms to death to defend their numbers which are usually based in an idea or thought that has no proof of concept. Ok so now I get the chance to be tacky and take a dig as I see this every day with Andy Slavitt who runs Medicare in this country. Everything he authors, talks about, etc. is all about numbers and he never goes to human side and we end up with a bunch of Quant models running healthcare with flawed data and methodologies. Indeed in the movie, Sully too had a bunch of “quantiated madness” and faulty simulations to deal with as well. Doctors every day are getting ripped with flawed data and algorithms and scored into oblivion with things that are just not true as well. You can read more about this at the link below at the quantitated madness dished out to their occupations by folks who bow to the all mighty algorithms without looking at the human side of care. So, sure Sully gets offered mental health counseling after the incident, and not being there, we have no clue on what it could have entailed but again one could ask would such behavioral analytics serve a purpose to make one doubt themselves even further? It could if the therapie were tweaked the wrong way. Turns out I’m not the only one who writes about this topic. I’ve writing about what I call “The Attack of the Killer Algorithms” for a number of years. I saw it come to surface with the Occupy Movement as that was a cause without a cause you could say as the perception of the general public seemed to view it. Deep down it was not without a cause, but they couldn’t find the focus and that’s because it was hidden in proprietary algorithms they couldn’t see, talk or relate too, but they knew something was wrong and that was sufficient to make a statement. There’s a new book out by Cathy O’Neil, a former Wall Street Quant during the financial crisis that’s worth a read. I have to be honest and say I have not read the full book yet, although I feel like I almost have as I have read her blog for years on the same topic, the dark side of big data that she covers. I try to group together other like minds on the Killer Algorithms page of videos and links to help folks understand what’s going on out there. For a preview of such, just scroll on down to the footer here and watch the 4 videos. “Weapons of Math Destruction: How Big Data Increases Inequality and Threatens Democracy” is the name of the new book and you can link here to Amazon to find out more about it. The book has been longer over due and she tells you how this insideous insidious “scoring” systems of algorithms works. There’s some good examples on how teachers are “scored” and what happens to them when subjected to flawed data and flawed methodologies of “scoring”. She’s a lot smarter than me and I used to develop software so I know as well as anyone does who writes or has written code on how dishonestly for profit can live in proprietary computer code. Cathy takes you to the next level up which are the mathematical models that are created before the computer code is created to automate “scoring” processes. A model is written first and then comes the code that you can’t see, hear or touch. It’s just there, gathering all kinds of data about you from God knows where and “scoring” you into some value system. In her words, Cathy states we are all members of a cult without knowing we’re in one and that’s pretty much how it is. To understand how this works, watch video #2 in the footer as the Quant documentary does a pretty good job for the layman to understand the basis of how these complicated formulas work. In the words of Bill Gates “software is just a bunch of algorithms working together”. As people we can’t be bias or are not supposed to to be, but what happens when the algorithms (that are created by humans) are bias? Nobody’s doing anything about the “Code Hosing” that is taking place out there. Again if you follow me on Twitter, I call it Code Hosing as that’s what it is, people being hosed with computer code they know nothing about other than how they are marketed to “trust it”. People like Cathy have been urging the release of some of this proprietary “scoring” algorithms and code so we can see what makes it work, as how else can you validate models and code? Want to see how you get scored every time you fill a prescription, something that all of us do? Read the link below and see how these bias algorithms use all kinds of non scientific metrics to “score” you. Pharmacy benefit managers get away with this garbage and soon the score may block you from access to some expensive drugs too. This too is secret and you have no access to the score of methodology used to give you a prediction grade. If you watch the Quant documentary in the footer, Mike Osinski who wrote the software for the mortgage scams that took place and crashed the economy, he’s has some real words of wisdom for his part. He wrote the software the banks used and states is was never meant to be used the way it was to refinance loans. His best quote from the video is “with software you can do something about anything, create all kinds of virtual worlds to function in, but what really matters is what happens in the real world”. That’s a fact as again as I mentioned above people get involved in chasing all types of virtual values and forget about the “real” world and God knows he saw it first hand. I like the part where he coudn’t even sleep at night for all the bankers and financial folks wanting more code and as he said “you have to right, you can’t be wrong”. What those words really meant though during that time was “you have to be right and shove the money to the direction of the banks”. Virtual worlds impact and affect all of us. I like to use the world of Volkswagon who cheated with their computer code as a damning example as everyone knows about it by now that they cheated with their proprietary computer code. Stop and think about this as the company created a perfect little “virtual” world of cars that did not pollute; however, in the real world they did pollute, so be a skeptic when you need to be. Sometimes the only way get “get on” to the cheaters is when we notice the output of the algorithms not putting out results that can be trusted. The link below is also another of Cathy’s publications that is worth a read as well from a few years ago. Charlie Siefe, NYU, in video #1 in the footer also tells you about the Code Hosing taking place today and how we all take in numbers that are tossed at us with nobody questioning what is written, context is everything indeed. It’s interesting as his talk is a Google’s NY headquarters telling their employees how they get duped. Big people with money and somewhat good intentions get duped. We all remember how Bloomberg and Frieden who now runs CDS were duped on Big Gulp. It was just another model created that was supposed to change behavior on what size of soft drinks people could buy and it failed miserably. I’m sure both of them would maybe like to erase this chapter in their lives of the Big Gulp Dupe, as it was so much in the news as well as it’s failure. They sucked in flawed data and a big failed model. How Many More “Bloomberg Big Gulp” Failed “Proof of Concept” Models Can We Sustain Before Everyone Splits a Gasket? Bottom line is that all of us as citizens in the US are “scored” into oblivion and why even get out of bed every day (satire) as we have these huge, heavy ball and chains of what are called “risk assessments” that are tied to our ankles. We get tired of walking around with that excess weight, which is exactly what it is. Shoot we are so risk assessed that one wonders so any of us have the right to walk around this earth as we are a risk to everything! Sure there is legit scoring and qualifications that need to exist and those models are not going anywhere soon but we’ve taken “scoring” to a new limit to where nobody has much worth except the algorithms and those who worship those virtual values! This not how the world is supposed to work. Anway, back on course here with Sully, my big take from this movie is the fact that it did put “scoring”, flawed data, and bad models flat in your face on how we are looking at value today and the NTSB was worshipping the Holy ground of some flipping algorithms and tried to denounce a real hero named Sully. Obamacare – One Big “Attack of the Killer Algorithms” No Matter Which Direction You Turn, Compounded With a Lot of Government and Consumer “Algo Duping”…. As we’ve warned before, The Interstate Medical Licensure Compact, is not going to solve the problem it claims to fix. It simply creates a new bureaucratic entity with little meaningful accountability. Holds specialty certification or a time-unlimited specialty certificate recognized by the ABMS or the AOA’s Bureau of Osteopathic Specialists. The specialty certification or a time unlimited specialty certificate does not have to be maintained once a physician is initially determined to be eligible for expedited licensure through the Compact. Because of the above wording, the Commission will now claim they aren’t requiring MOC for Compact participation. However as board certification is required at the time of initial determination of eligibility, physicians not participating in onerous recertification schemes when applying for a compact license may find their ability to obtain a license via the compact in jeopardy. Doctors play an integral role in healthcare. Highly educated and experienced, they have been relegated as servants to business people. But who do you want making medical decisions when you become ill? A well-educated and trained physician, or a profiteering businessperson? Their backgrounds are different. Doctors have always been highly scrutinized, whereas hospital administrators, insurance executives, and Big Pharma CEO credentials are lacking. Yet, these businesspeople are the ones short-changing the naive public for personal financial enrichment. Below you will find my most recent posting. Feel free to pass it forward if you believe it is worthy. If you do not wish to receive my emails, let me know and I will remove you from my list. At the end there is a link for Comments.